Another Ballband. You are amazed with my cleverness and sheer speed of knit, no? My little gymnast. 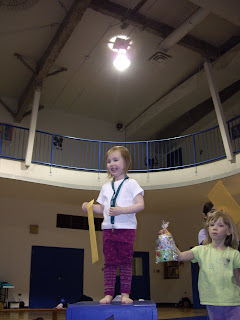 She was so proud of her cleverness in "winning a golden medal". My father's 60th birthday party meant a drive to the next town for a nice dinner in a nice restaurant. The nice ones here are more like an Applebee's than like a nice place to eat a special dinner. We stopped here to change the DVD in the player for Girly. There were a couple of big jackfish in there and quite a few average sized ones too. Alas, my cleverness does not extend to taking pictures of fish under the water. Glare on the top, yes, fish under the surface, no. The sky alternates between grey with fog and grey with sunny blue spots. Rain last night has brought green for morning's light. Old growth is giving way to new life. While others are patiently awaiting warmer days and more rainy nights. As in Thank God It's Knit. Because although I am reasonably intelligent, I can make a real mess of the Ballbanding if I don't read the pattern first. Apparently I was not born with the Ballband Dishcloth pattern embedded into my DNA. Note the really tight cast off. I didn't have enough yarn left to cast off normally so I had to lift the live stitches one over the other until I had none left, then thread the bit of tail left through the last loop and tack it down. Some more green growing things. It's pretty dry right now so the ditches have the most life. The grass is taking a while longer. It's supposed to rain today and a bit more next week so hopefully the green will explode to life after that and maybe the lakes will come up a bit more too. Someone loves cuddling Sam. The feelings are not necessarily reciprocated. only dishcloths getting done round here! Grandma and Girly's cousin came to play. Apollo and I played keep away. The man in the moon watched. Prayer overheard at the neighbour's house as I stood in the centre of the drive taking pictures of the moon. Thank you for keeping the crazy lady from moving into the neighbourhood until after the children were grown up and gone. Please keep her in the house or at least not showing off the crazy while the grandchildren are here. My knitting for the past two days. Along with a row or two on my ISE 4 scarf and a new bag to auction at the Relay for Life. Note that the blue washcloth is very wonky. It was originally going to be sold at a fall bazaar, but once I finished with it, I knew that it was going to live with me, poor thing. Maybe the white will find a new home though. A sunny warmish day called to us louder than the knitting called to me (three toddlers are really loud and persistent) so out we went. Apparently we like to play in ditches. We are maybe the really classy ones on the block. I did wander a little though. Some of the trees got pretty burned this year with the cold and so little snow. My new desktop wallpaper. There is something coming up in my garden! Can you tell what it is? My actual physical gardening so far. Put the pots out, bring them back in. Shopping sort of locally. Some farm fresh eggs from the brother of a friend of my Dad's. Look a green one! Farm fresh = wash really well before cracking. I might get to finish the white dishcloth today. My ears are nearly pestered off already though so more than likely not. We are waiting until after the naps are done to go outside though since the wind still has a bite to it. I found something in the trees this morning. A pretty little bundle of goodies for me! There is some Regia sock yarn, a pretty needle case (the lining is a rich copper material), a notions bag (so cute) and a beautiful card. Some cashmere (Cashmere!) gloves. They are so soft and beautiful. Finally, last and best of all, a gorgeous cashmere (Cashmere, I tell you!!) scarf based on the Bird's Nest Shawl pattern. All done by my ISE 4 scarf pal, the lovely Hila. Thank you Hila, everything is beautiful and perfect. This morning is cold enough to be able to wear a scarf and gloves too. I've never felt cashmere yarn (It's amazing!) either so this is a real treat for me. Relay for Life Prize Alert! I found more yarn under a tree in my yard yesterday! It is beautiful stuff! It is Briggs and Little Heritage in their 150th anniversary colour. Anniversary Twist. Beautiful colours! I bought it (it was a good deal) and figured I could make myself Wendy's Flair Jacket and have enough left over for a bag, but since I told myself not to buy anymore yarn, this kind of blows that out of the water. What to do? Why, offer it up as a prize! So here it is, anyone who donates will be put in the pot once for every $10.00 donated. So far there are two prizes (Plassard 100% silk overdyed by me and the Anniversary Twist) with two more in the works and only the tickets drawn will be removed from the pot. If you donate $10.00 your name goes in one time, $20.00 - two times, $30.00 - three times (This means you can win more than one prize) and so on on so on. So how may are here? 10 skeins at 196m/215yds. Enough for a good sized sweater or jacket. Recommended gauge is 17st = 10cm/4" on 5mm/US8 needles. In the sidebar under my profile is a Paypal Donate button (you can also e-mail me at knittingintothecold @ gmail . com for an address to send cheques or money orders if you'd rather). Your donation will go to pledge me in the Relay for Life to help beat cancer and hopefully find a cure for all forms of this nasty disease. Photos?! Ve got your photos! Friday I had gone to Dryden to get some shopping and an errand done. While I was there, I decided to duck into the Salvation Army to see what they had for dresses for my girly girl, ... Girly. Nothing worth buying for her, but I found some really good sweaters. The red one is 100% cotton, but it is (machine)knit so densely that it is nearly wind proof as I found out yesterday. The bottom left is the first Alpaca blend sweater I have ever bought and it is surprisingly scratchy. It's light and warm, but since the knit side is inside, it isn't as soft as the outside. Good thing it's for the Mr. and he'll wear it over another shirt anyway. This though is the real treasure. Handknit in the round. Nice and soft too. Way too big for me, but since we do want to have another baby after Girly is in school and I have worked for a bit, I'm going to put it away and save it for then. I got big enough with Girly to fit it, so it will probably fit during another pregnancy. Whoever knit this is pretty darn good. Check out the inside. Saturday there was a huge garage sale at the home of a packrat collector. I got some really nice baking dishes in sizes I don't already own and a few other little things, but this pot put a smile on the Mr.'s face. Funny. I really bought it for yarn dyeing, but since his annual May long fishing trip is coming up, he thinks it would be great for hanging over a fire and boiling potatoes or water for doing dishes. So he gets to take it with him as long as it comes back in usable shape. The poor neighbours. I am one step away from a cauldron in the backyard. There were a ton of bottles there too and I thought these would be a pretty way to store beads and buttons. Although the two with the handles on them are originally wine decanters and may get used that way again. Right now they are clean, shiny and showing me how long it has been since I washed the rest of the glass stuff on top of the cupboards. The aqua glass one had me thinking of a nice boucle yarn. It's my favourite. Then there is the real find. I was looking through a box of stuff, when I noticed this. A work in progress. Apparently the wife was a knitter (All the rest of her stash had already been appropriated by the mother of the woman running the sale, I offered to fight her for it, but it was already gone.) and this was in her box of UFOs. I won't be able to finish it since there was no red yarn and what is left of the white and black wouldn't be enough anyway. I like the pattern though. I couldn't even find the other knitting needle. It is wool so I think a nice felted bag, clutch and wallet type of thing. It needs washing anyway, so why not in hot water? Look at where she got the wool! Apparently when you bought a sweater kit from Mary Maxim, you had a choice of wool or acrylic. Nice choice and it feels like a nice wool too. Maybe Mary Maxim will consider bringing it back since more and more people want good quality wool. Tomorrow another prize for the Relay for Life draw. It's a good one too. Hint: There are many. the rain is falling. The kind that falls all day. I am off to a giant garage sale. I'll show you the sweaters I found at the Salvation Army store yesterday on Monday. A handknit is among them. That's what you have the next day when you are not supposed to go nuts on the sugar and caffeine, but do anyway. Yesterday was spent eating lots of protein and fibre snacks to get myself back on the level with the whole healthy energy/blood sugar thing. Also finding and finishing many things that I had started, then forgotten about the day before while in the midst of the craziness. So in lieu of knitting and or talking about knitting, I give you a bit more reinforcing the crazy to the neighbours. While standing outside in the dark, arms stretched over my head with the camera held on the top of a nearly 7' pole trying to get a not blurry picture of the moon, the neighbours pulled into their drive and their lights illuminated me in full wingnut mode. But, dammit, the moon was really cool last night. This picture doesn't do it justice. Only the bottom crescent was lit up but it was so bright you could see a shadow of the rest of the moon. As though the moon had on a pair of John Lennon style sunglasses that didn't quite cover it all up. The brain is still not quite eloquent. "Don't expect brilliance from that one anytime soon." This morning I woke up in a giddy mood. Still not firing on all cylinders, but foolishly happy anyway. No children but my own until Tuesday! An extra long weekend to chill out, play with Girly and to pester Apollo, Sam and Jezzy. The chores are glaring at me right now. I'm pretending I can't see them giving me the evil eye. In the midst of getting ready to feed the pets and medicate the dog, the phone rang. Ah crap, I thought, my part-time child's father got called in and I won't get to have my day off after all. Wrong! The woman asked for me (I am sounding a little rough and manish this morning, well most mornings until I get the voice box warmed up then I just sound manish) and then told me her name. The cylinders misfired and although the name sounded very familiar I wasn't really sure if I had heard it right. I was on the verge of wiggling a finger in my ear when she said her blog name. Awesome! I was blown away and maybe a little weird. What a really cool way to start out a day. Hi! I hope I wasn't too weird for you. Now, I must escape the house before any parents change their minds and call me up. Living on caffeine, missing the nicotine. No real progress to show today because when you are overtired and hopped up on caffeine and sugar, you can't concentrate, your heart races and your hands shake. I even had a few cravings yesterday and it has been a long time since I've had those. Some knitting got ripped and some got another row or two. Apparently when 35 stitches are just the right size, casting on 50 to make it a size or two bigger is not a good idea. The little fall jacket became giant. It would have taken Girly nearly 5 years to grow big enough to wear it. I couldn't concentrate on knitting so I tried winding yarn. Apparently that was too much concentration too since I kept putting it down to go do something and forgetting to come back to it. Even though the brain was racing with all the stimulation, it was going to fast too remember where it had been. No wonder kids freak out so often and can't sit still and be quiet when they have too much sugar. Even your brain can't sit still and be quiet. I wanted to try seaming up this little Baby Kimono (in the Mason-Dixon book) but that was too fiddly and as much as I need the practice before I move on to Invested, I couldn't do it. I managed about an inch of seaming. Before I had to quit, too shaky and crazy. So I tried playing with Apollo for a bit. We adjusted one of his meds so he's feeling a bit better and there were no piddle puddles on the floor this morning. He still can't play for too long though since his system has some recovering to do before his energy levels will come back up to where they were. Thank goodness yesterday is over. I think I am going to skip the treats today and limit the caffeine to one cup of coffee. You can spend a fortune on toys for them and they're still gonna like the box best. Knitting has suffered due to a small child who thinks she needs to come and crawl in with me at four a.m. every morning and lay on me with her shoulder in my voice box. Not very conductive to sleeping. Also, the Addison's is still not under control with Apollo since he is still drinking a lot which means he is peeing a lot which means I am getting up in the middle of the night to let him out and very early in the morning to clean up the pee spots before the children get here. I need a nap and also a pot or six of coffee. The sun has decided to make an appearance so Invested is blocking outside. Not at night, but I'm going to put it back out in an hour once the sun warms things up again. 1. I do my best to teach the children that violence is not tolerated in our house and that it hurts other people's bodies and feelings. The problem is that they still see so much of it everywhere. I am very glad that people are starting to think about what they do and what their children see. I am also glad that people are using discipline with the children again (not hitting/spanking though). I've met so many spoiled people with an entitlement attitude that it is worrying about what kind of countries we are going to be living in when they are running the show and we are too old to do much about it. Do you know something though? There are some acts of violence that are on the rise and most people don't think of as violent. Violence - an act of aggression. That would include many bad habits behind the steering wheel. Speeding (almost all "accidents" are directly related to one or more speeding drivers), weaving in and out of traffic, tailgating, honking the horn the second the light turns green, waving a fist, flipping a finger, yelling, cutting people off, swearing at people who pull you over or hand you parking tickets and of course the most violent act behind the wheel, drinking and driving. The list of offenses people commit while driving is long and far too often there are children in the vehicles. Either the one committing the acts or the one the acts are against. I put accidents in quotes because the true definition of accident doesn't fit the majority of car crashes on the road. Definition of the word accident. If you are breaking the laws of the road, a crash in not unprovoked, unavoidable, unexpected or unforeseen. If everyone on the road obeyed the laws, there would be a lot more people walking around this planet right now. 2. I do try to do small things for people when I have the chance. Our society puts so little value on humanity that people often don't feel their true worth or even that they are visible. We place too much emphasis on how well-behaved our children are, what we have, wear or look like and too little on how we behave toward others. If everyone helped someone just a little the changes that would happen in this world would be phenomenal. You don't have to do big things or even donate a ton of money to have an impact. Sometimes a little understanding makes the biggest changes. Telemarketers/charity solicitors calling you at all hours? Be nice. They are just doing their jobs and trying to earn an honest dollar. You don't have to listen to their spiel, but you don't have to swear at them and slam the phone down either. Telemarketers - politely but firmly tell them you are not interested, wish them a good day, then quietly hang up. Charity solicitors - ask for their website address, tell them when you have funds available you will go to their website and read what kind of work they are doing, then consider whether or not you will donate your hard earned money to them, wish them a good day and quietly hang up. A smile can do a world of good too. Especially for the tired, embarrassed, frustrated mother just trying to get a few things done while the children go nuts. Trust me, she already feels like she is failing. She really doesn't need your recriminations or "advice" on how to fix herself. Sometimes an understanding smile and a pat on the back for her patience can help to ease her day a little. It may be the only positive thing that's happened to her all day. 3. No, I don't think that electric cars are green. The majority of hydro power is either completely nuclear or supplemented by nuclear power. Some plants are nearing the end of their operating lives and the waste products are not only toxic to humans, but it takes them a long time to break down and that's if they break down enough to be considered safe. If we don't stop producing toxic waste (yes, the oil industry is part of that) how much of it is going to buried under the ground? When are the barrels containing it going to break down? Will our future generations be living in toxic waste dumps because of all those barrels of the stuff we buried? It doesn't matter how clean the air is if the earth itself is hostile to life. Before we start patting ourselves on the back for using electric cars, we need to be actively finding ways to change how we produce hydro and pressuring our hydro suppliers to make the changes as well as weaning ourselves off oil and fossil fuels. In the end, cleaning up our habits as well as our earth is the kindest thing we can do for our future generations. The only thing that is going to last into the next millennium is our planet. Our buildings, our cars, our technologies will all be broken, gone or useless by the year 3000. The earth still needs to be here though. Hopefully humans, plants and animals will still be here then too. Let's let our footnote in the history books be known more for the clean up we did than for the stuff we had. The green cotton sweater is growing slowly. Of course if I hadn't ripped it it would be even larger, but the first attempt was exactly the same size as a sweater that just fits Girly. Knitter's Law dictates that if you make a sweater to fit a child, no matter how fast you knit, that child will have a growth spurt the day you seam it. So I'm making it bigger and hoping I can get it to work out. The Fantasi sweater got ripped too. Same reason. This yarn is not easy to pull out, but it is no where near as hard as mohair. I ripped one stitch at a time and held the old stitch with one hand and pulled with the other. Once I got into a rhythm it went surprisingly fast. It also held up very well to ripping. I'm going to change this into more of a fall jacket type thing than a cardigan. A little jacket with this stuff needs some big colourful buttons so instead of button holes, I'll knit a flap on one side and add some loops for buttonholes. If I have enough yarn, I'll even give a hood a try. I bet shortrows won't show holes with this stuff. It rained a bit yesterday and the snow is nearly gone now. Humidity levels are starting to come up a bit (thank you, God) and so are the temperatures. They are still hovering around 0*C/32*F at night, but during the day, it is getting warm in the sun. My shoots are doing really well and I am getting quite a few of them. Some of you may recognize what they are now. Sshh, don't tell. 1. Are you teaching your children that violence is not the way to solve problems and that it is completely unacceptable behaviour in all circumstances by both your words and your behaviours? 2. Do you show kindness to people in little ways? Push a grocery cart across the parking lot for an elder or someone with two carts, hold a door for the person behind you? Offer to carry a bag up the stairs for someone who is obviously overburdened? Smile at the poor mother who's children are screaming in the store? 3. (Totally different subject) Are electric cars really a green alternative?